The Mandorla is a boutique colored boost pedal, inspired by vintage treble boost pedals from the ‘60s, with some modern twists. The MOSFET gain stage at the heart of the Mandorla is set up to take full advantage of the delicious non-linearity inherent to MOSFETS for gobs of even order harmonic distortion without clipping to produce a sound not unlike old tweed-era tube amps—clean, but colored. 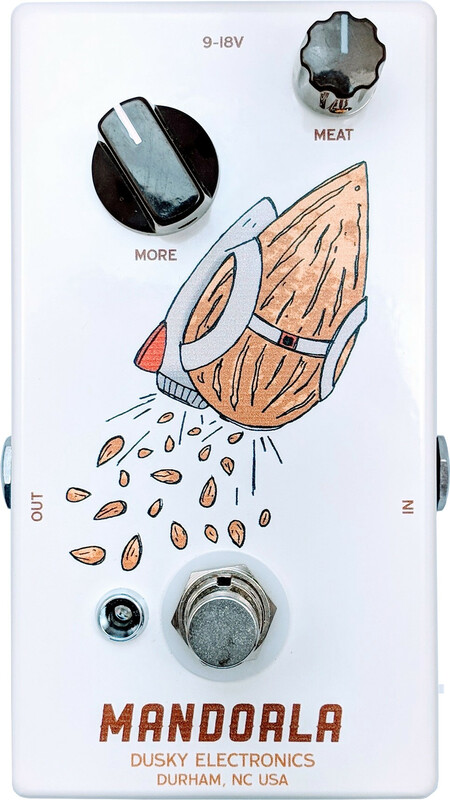 Even with gain set at unity, engaging the Mandorla sweetens and enhances—kind of a “more good” pedal. The Mandorla isn't just for guitar—it sounds great on bass, keyboard, or any electric instrument. The Meat knob controls the low end content from the pedal. With this knob all the way down, the voicing is very similar to vintage treble boosters of time immemorial. With the knob all the way up, the Mandorla is a full range booster with tons of low end available. At intermediate settings you can dial in or out just the amount of bass you need to sit in the mix with your bandmates. You might be surprised at how useful getting rid of some bass can be for helping each instrument in your band stand out and be heard. The More knob controls the output volume—turning it up, there is plenty of clean gain available to drive your tube amp into sweet, musical overdrive. Go team Dusky! I LOVE the Mandorla. Once I turned it on, I never wanted to turn it off. It adds the perfect amount of harmonic sparkle. Just wanted you to know I finally got to try the Mandorla out last night and it is perfect! Solves my tone issue amazingly and beefs up my sound just as I hoped. Really opened up my amp and let the pickups sing on multiple guitars. Thanks again! The @duskyamp Mandorla is a god send for tracking bass, it's helped us dial in the perfect amount of presence and structure on these recordings. Literally could not be happier with a pedal right now. What I love about analog circuit design is that simple circuits can have such complex behaviors. Something like a single tube or a single transistor—in all its classic, nonlinear, imperfect glory—is, at the end of the day, downright complicated in the way it behaves. And it’s those complexities, those infidelities, those inaccuracies in reproduction that make a circuit musical. That’s where the magic happens. The concept for the Mandorla was to really play to the inherent, delicious nonlinearity of the MOSFET transistor and design a circuit that misbehaves in the most beautiful way possible. The Mandorla doesn’t, on its own, produce clipping distortion, although it can certainly push an amp into overdrive and clipping. The Mandorla does produce a lot of harmonic distortion as a result of its less-than-faithful reproduction of an instrument’s signal, and, in a musical context, this just makes it sound good. It’s the same reason tube amps sound so good. The Meat knob is a crucial element of the design. The ability to control the bass contour of an instrument’s frequency response gives you the ability to find the perfect spot in the frequency spectrum for your instrument to sit in the overall mix. What some less-experienced guitar players don’t realize is that, in an ensemble setting, turning down the bass frequencies on the guitar can help to make both the guitar and the bass more-discernible in the mix. When each instrument is occupying its own spot in the frequency spectrum, the result is that the audience can hear more of each instrument in the mix. Of course, with the Mandorla, you can also have a lot of bass, if that’s what you need. In fact, I use the Mandorla all the time on bass. I wouldn’t hesitate to try it on anything. I guess what I’m most proud of is that such a simple circuit design—with an equally simple two-knob user interface—can sound so good and be so versatile. It really can be used in a lot of different places on a lot of different kinds of instruments. And it really shines in an ensemble setting where every instrument is trying to be heard. This feature is experimental. It should work with the latest versions of all major browsers. Older browsers may need to be upgraded. There is a known issue with Apple iOS devices. If you have the latest, greatest version of your browser and it still doesn't work, let me know. If you have any feedback at all, you can send it to: cr@duskyamp.com.